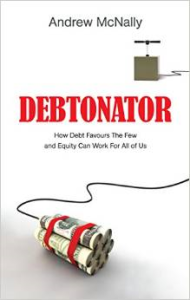 Andrew McNally’s new book Debtonator. We are all swamped in debt. Households, corporations, governments… debt has become so ingrained in our culture, it is an unquestioned fact of life. However, there is another way of bankrolling our economic future, one that could lead to a much fairer society: equity. There is increasing evidence that over reliance on debt finance is damaging both business and society. Debt leaves control and ownership in the hands of too few: it is a direct source of extreme inequality. Equity finance can redress the balance; by broadening direct ownership of assets through equity, we can make everyone better off – not just the few. There is value in equity way beyond what financiers, economists, investment bankers and many corporate CEOs will tell you. It is the value of aligned interests, of trust and fairness, of optimism and patience, of stability and simplicity, of shared endeavour. Only when we unleash this value will economic democracy secure the political democracy that we cherish.